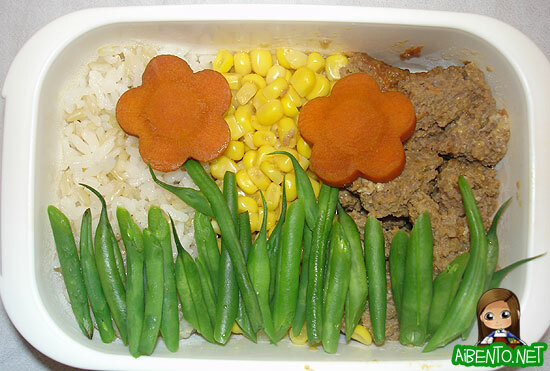 MIL made some really yummy meat loaf last night but I found myself thinking for more than 20 minutes on how the heck I was going to make meat loaf look pretty in a bento. Much to my delight, she had a container that looked just like a bento box, so I happily borrowed it for lunch. After much thought, I settled upon making little foil dividers under the food and separated the rice, corn, and meat into neat little thirds. It still looked rather bland and colorless though, so I kept thinking more on the way home and nothing came to me until I got home and looked at it again. I needed to add more color, so the obvious choices in the fridge were green beans, edamame, peppers, or carrot flowers that I’d simmered last week. Since OOT was talking about fruit salad yesterday and I didn’t use the usual Hello Kitty bento box for food, I decided to make a larger fruit bowl for today. 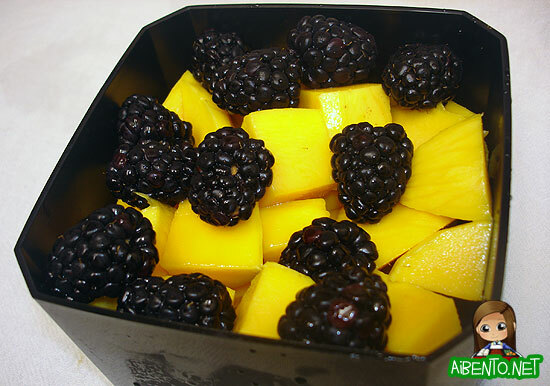 Chopped up and entire Fuji apple, a mango (which baby girl ate almost half of), a kiwi, and blackberries. Added a cheese wedge and done! This comes out to around I dunno, a 4 point meal with the cheese? I was a little lax with the meat loaf because I took a really small slice and there really weren’t that many un-Core ingredients in it. Later this week I’m being taken out to lunch for Administrative Professionals Day, so I’ll be missing a pretty lunch. Hopefully I will have some leftover to be creative with!